The Purpose Driven Life by Rick Warren is one of the best selling books of all time due to peoples desire to learn their true purpose. In this podcast Tom Beal shares a process that only takes minutes to find your true calling in life at this moment. It has helped thousands and is here to assist you today. Enjoy! 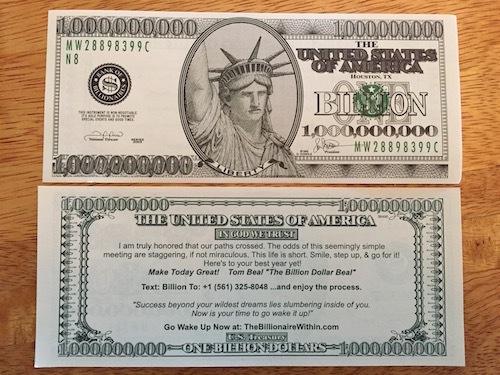 Tom Beal’s “The Billion Dollar Beal” business card with inspirational message about synchronicity and lesson about your life purpose. Puts smiles on peoples faces throughout the world.